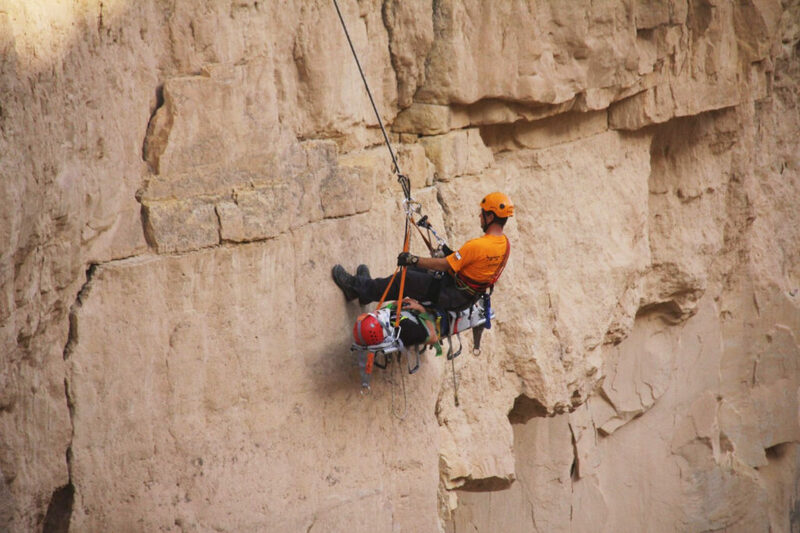 One Sukkot, the rescue unit received an urgent call from the Nature and Parks Authority about a father and a toddler that fell off a cliff in the Arugot Reserve, near the Dead Sea. Immediately, the team drove to the reserve under the authority of the units deputy commander. They drove to the scene to gather more information, gave a preliminary report, and began planning the rescue mission. The impact from a high fall causes immediate danger to life, so time was of essence. Soldiers from the IDF’s rescue unit, who were stationed nearby, joined The Israel Coalition’s Search and Rescue Unit because it was a busy holiday season when there are a lot of hikers around the Dead Sea area. As the teams left to find the father and toddler, an air force helicopter was called to join the rescue efforts with army medical staff. When the team did indeed arrive at the scene, they found the toddler with severe head trauma, unconscious but breathing, and the father with severe injuries on his arms and legs. The Unit treated the father and baby, who was about two years old, with emergency first-aid on the scene. When the helicopter landed and the doctor on board saw the injuries that the baby had sustained, it was decided that the baby would be transported to the hospital alone, as getting the father onto the same helicopter would delay the baby’s emergency treatment. The baby was transported with medical company while the rest of the team continued to extract the father, using a stretcher attached to a rope system, that brought him to a waiting ambulance on the side of the road. The immediate decision to not wait for the father, and instead take the baby to the hospital as fast as possible, saved the toddler’s life. Both father and child survived. Another two lives had been saved.